The art of the knotted wool carpet is not indigenous to India, where the climate discouraged the use of any but the lightest cotton floor-coverings. Carpet-weaving, which had developed among the nomadic peoples of Central Asia and Iran, was introduced to India by the early Mughals, who swept down through the Khyber Pass in 1526. They established an empire that lasted until the removal of the last Mughal emperor by the British in 1858. The pile of this very finely knotted millefleur carpet is goat hair, taken from the underside of the throat and neck, which accounts for the particularly fine, silk-like texture. In its main field, floral sprays, blossoms, leaves, and palmettes are connected by scrolling vines in a repeating pattern. The border reveals a more typically Indian inspiration with a scrolling pattern of lotus buds and flowers. The lotus is used throughout Indian art, both as a decorative element as in this case, and as a symbol of the energy of nature, of purity and (in Hindu-Buddhist contexts) the realisation of Enlightenment. Millefleur (‘thousand-flower’) carpets are so called because their exclusively floral patterns incorporate a profusion of tiny blossom clusters. This style developed in Mughal floral design from Eastern decorative influence, together with a tendency towards smaller, more intricate ornamental elements. Purchased with the assistance of the Friends of the Ashmolean Museum and the MLA/V&A Purchase Grant Fund, 1975. The art of carpet-weaving developed among the nomadic peoples of Central Asia and was not indigenous to India, whose climate discouraged the use of woolen pile rugs as floor coverings. The manufacture of carpets probably began under the early Mughal emperors, especially Akbar, who, according to Abu’l Fazl in the ‘Aīn-i Akbarī, “has caused carpets to be made of wonderful varieties and charming textures; he has appointed experienced workmen, who have produced many masterpieces … All kinds of carpet-weavers have settled here, and drive a flourishing trade. They are found in every town, but especially in Agra, Fatehpur and Lahore.” Akbar’s weavers probably came from Herat (in modern Afghanistan), and the Persian influence on Mughal carpet design remained strong during the 17th century, when many of the finest examples were produced, although overlaid by the characteristic Mughal taste for bold floral decoration which developed under Jahāngīr and Shāh Jahān. By the 18th century designs were becoming more rigid, but a high level of technical quality remained. 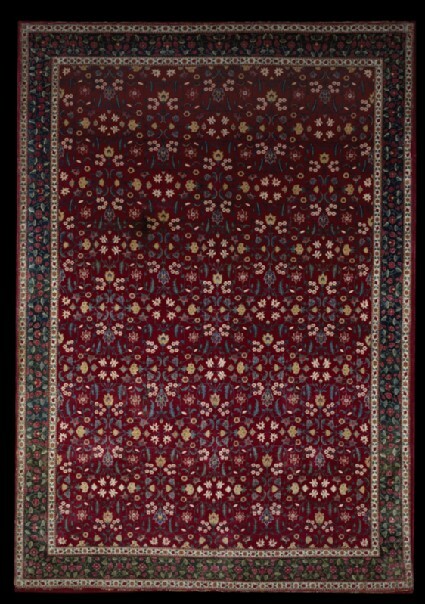 The repeating floral pattern of this very well preserved and finely knotted rug, with its symmetrical groups of flowers and serrated lancet leaves on a dark wine-red ground, derives from a classical Herati model. 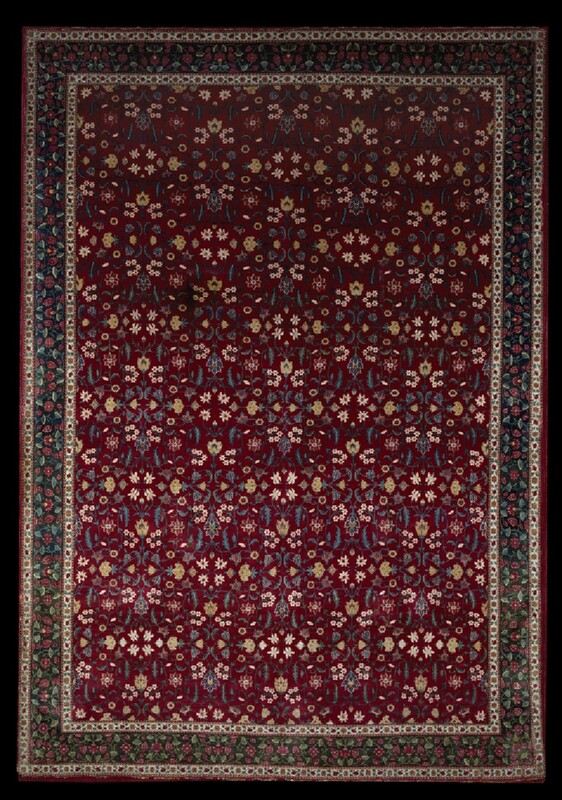 The border of lotus buds and flowers, however, is of Indian inspiration; the same design is found on two similar rugs in the Metropolitan Museum, New York, and another which was sold at Christie’s in 1981.